Diagnostic Test Group (D.B.A. Clarity Diagnostics) manufactures, markets & sells its own proprietary line of point of care rapid diagnostic tests and related medical devices for the Alternate Care, Acute Care, and Continuum of Care markets. Our number one priority is to provide our customers with the highest quality product at a fair price. DTG believes that this is accomplished through integrity, honesty and superb customer service. The CLARITY brand is equal or better than any named brand in the market with the exception of price. Expect to save money without compromise! Most CLARITY products are made here in the U.S.A. Thank you for giving us the opportunity to serve you and your patients! 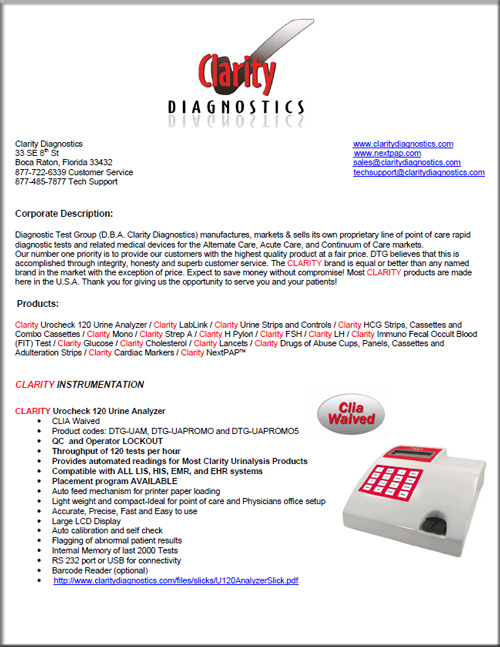 For information on Clarity Diagnostics products, click here or on the image to the right.